The Spartans were legendary warriors. Unquestionably the toughest, strongest out there - feared for their power and endurance. 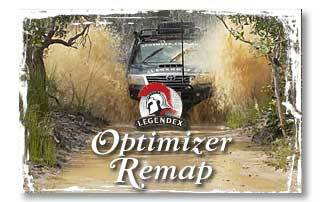 Legendex exhausts are Spartan tough, made from 409 grade stainless steel. 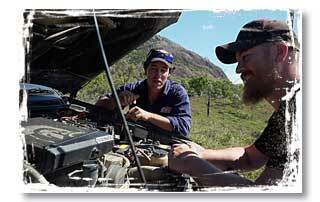 They’re Australian made performance products designed for the demands of Australian 4WD touring, towing and off-road through the toughest out-back conditions. With guaranteed power gains of at least 10% (exhaust only) and up to 35% (with exhaust and PCM chip) you’ll be rumbling down tracks and towing up hills with more strength and muscle than other road warriors. Own the road and install a Legendex performance exhaust kit yourself. It’s easy, fast and you don’t even need a lift kit or any special gear. The Legendex Big Boy intercooler range has expanded again. Our R&D has seen the some engine charge-air temperatures running 48% cooler than with the stock intercooler. That's a huge improvement with meaningful gains in power and lower engine temps. 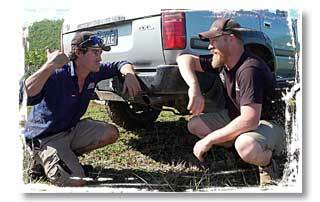 Off-Road Armour protection for your 4wd is the best insurance - and easy to install with our range of rocksliders. 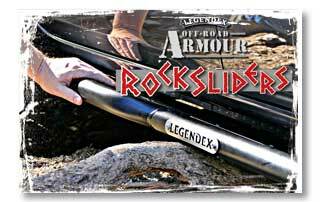 Made from military-style reversed dimple-die plates for strength, foot grip and drainage our rocksliders (also called rock rails) not only look the part but are some of the toughest rocksliders on the market. We hate accelerator lag - so does the Thrust Monkey. This little guy is smart & agile with fiendishly fast reactions. With 21 custom throttle maps, you get instant throttle response, power when you need it for safe, towing and overtaking, making driving enjoyable again. Plus the off-road mode gives you even greater throttle sensitivity for better traction control. Legendex Power Command Modules have nine custom tunes created especially for your Legendex exhaust - that makes a big difference. Most other chips are tuned only for stock exhausts. To get performance gains, these other chips put a higher fuel pressure into the engine because the stock exhaust is so restrictive. This raises engine operating temperatures and reduces engine life. The Legendex PCM does not have potentially harmful high fuel pressures. In fact your PCM and exhaust operate within the vehicle engine specs and will run cooler than stock. One of the easiest, cheapest and quickest bang-for- buck performance gains is simply fitting a high flow air filter. These washable-and- re-usable filters are the best on the market, letting your engine breather easier and filter more efficiently than others.